What can you say about a board book? As it turns out, more than you would expect. My Dad Is the Best Playground is about how daddies are simply so much more fun than anyone else on earth. The adorable toddlers in this book practically throw themselves at their dad when he arrives home, tie still intact. They are soon treated to Dad playing tunnel overpass, Dad playing swing set replete with climbing wall, Dad serving as an (almost) willing tummy trampoline . . . This guy must be a young dad because he has more energy than three regular dads. In the end, tie slightly askew, Dad tucks in two exhausted children, already sound asleep, into their cozy beds. 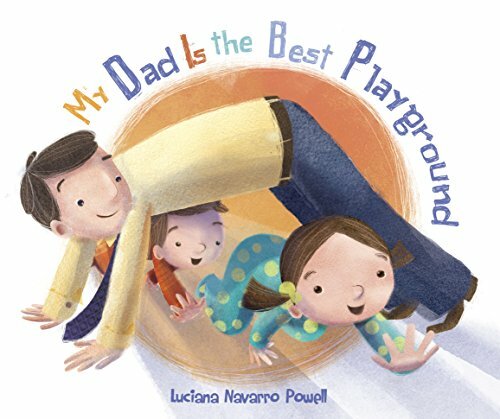 My Dad Is the Best Playground is full of so much exuberance and verve that you wonder how it could ever possibly be used as a bedtime story, but it works. The illustrations by Luciana Navarro Powell are beautifully expressive and so packed with movement and joy and color that you surely, positively, absolutely wish it would never end . . . kinda like special time with Dad. Lisa Rojany is the author of over 100 children’s books, 2 nonfiction adult books including Writing Children's Books for Dummies, and 3 YA novels. She is a former publishing executive and has run her own company, Editorial Services of Los Angeles, for many years.